In Chapter 10 of Multimedia Journalism we looked at creating email bulletins and, in module 10B4 within that chapter, at how you can mash up RSS feeds from a number of sources to create a new, curated RSS feed of targeted news or information. One element of that tuition now needs updating. The text below forms that update. Yahoo Pipes, which we used originally, as been withdrawn, so I have been on the lookout for a suitable alternative. Sadly, there isn't anything I can find that is as easy to use for the non-coder, and does as much, as Pipes. A number of people have offered lists of alternatives, and you'll find a range of suggestions here, here and here, but I wasn't entirely happy with any of them. They were either too complicated, or did not allow you to sift the information you were gathering as efficiently as Yahoo Pipes did. The best current option, for me, is a service offered by MailChimp and, as we are using MailChimp to create our email bulletins, that's pretty convenient. ChimpFeedr - like Yahoo Pipes - lets you add a series of individual RSS feed urls to a list, and then - at the click of a button - it generates a new RSS feed which combines all the posts going to those individual feeds in your original list. Well, if you get this right, you can create a feed that picks up on all the latest news or information in the area you cover. You can combine your own output with that from other specialists in your field, giving readers the place to come for comprehensive coverage of your beat. Your feeds need to come from a closely targeted area. That might be localities, if you have a local or hyperlocal site; an area of business activity if you are creating a B2B news product; or other news sources if you are covering a topic nationally or internationally. You'll need to be highly selective when combining feeds. Among them are feeds for Mail Online coverage of many celebrities. If you are a showbiz reporter, and want to create a mashup RSS feed from a range of key stars, this is a good starting point. You'd also need to identify other sources of news on the celebrities you have chosen. Choose the ones you find most useful in your research and you won't go far wrong. 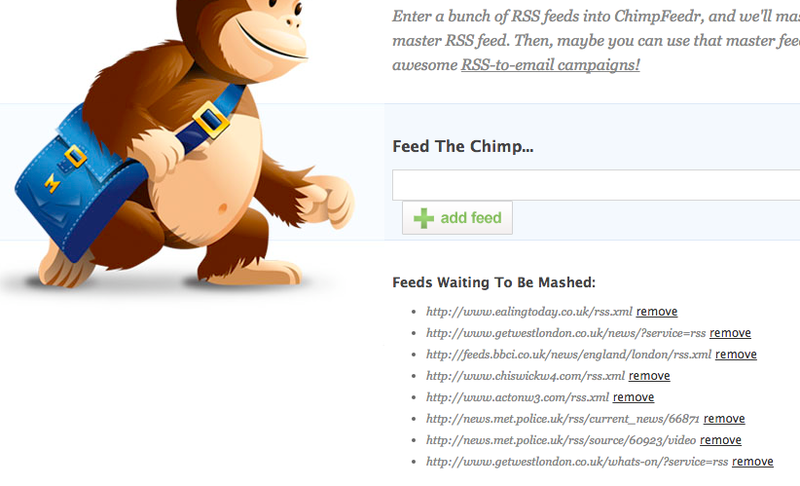 Click on the page’s orange RSS button, and you’ll get a screen come up that offers you various ways to subscribe to it. In the url address box at the top of the browser window is the feed url. Copy and paste it into the input area of ChimpFeedr. Some sites put this logo prominently on their homepage, others hide it, so you occasionally have to hunt it out. As a last resort, Google the website or blog name plus RSS and see if that helps. For this demonstration, I've gathered a range of news sources for the area covered by my hyperlocal news site, LondonW5 (creating it is covered in Chapter 2 of MMJ). I've gathered the RSS feed urls from a mix of local news sites, the Met police, what's on guides and transport updates. The grab below shows some of them ready to be combined. ChimpFeedr will ask you to name your mashup, and I'm calling mine West London Live. Click the 'Chomp Chomp' button and ChimpFeedr generates your new RSS url. As covered in Chapter 2 of MMJ, Wordpress lets you display content from an RSS feed on your website, using either a widget (if you are using Wordpress.com) or a plugin (if using Wordpress.org). You can place the widget or plugin on your website's homepage, following the guidance given in Chapter 2 (for .com sites, or Chapter 8 for .org sites). 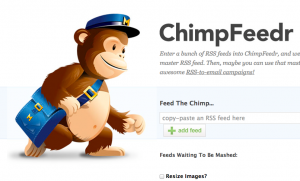 Then paste your RSS url into the box indicated, and title the feed.